I've been carrying it around for over 20 years now. I'm talking about my Official Elvis Presley Fan Club Key Fob. It's pretty worn - a lot of the enamel finish is gone and the leather has been patched up by a shoemaker. No wonder, since it's been with me nearly every day since I ordered it back in 1986. Tonight, I found the ad for the fob in a fan club magazine dated August/September 1986: "Beautifully fashioned in gold coloured metal, with red and white enamel finish, mounted onto a real leather fob." Maybe not so beautiful anymore, but still special. I hope to carry it around in my pocket for years to come. It's been a faithful companion. I wonder who else out there still has his or her Official Elvis Presley Fan Club Key Fob? 1. April FTDs maybe delayed. Well, no big surprise there. 2. Bootleg CD re-issues of the UK K-Tel (sounds like a guy from Supermans homeplanet Krypton) albums are now available on eBay. 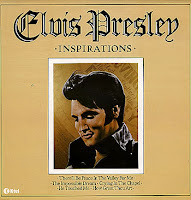 I bought one of them, Inspirations, on LP back in the 80's, and thought it was a great introduction to Elvis gospel music. But a CD bootleg version? No, thanks! 3. A computerised image of how the "New Overton Park Shell" may look like when it is finished in 2009 was the most interesting piece of news. Actually it looks pretty cool - except that the famous rainbow is gone. 4. An Elvis diamond supposedly created using the DNA from one of Elvis' hairs with a staring-bid of US $ 50,000. That one I won't even comment. I've just finished reading another chapter from the on-line novel Boscutti's Pure Elvis written by Australian film maker Stefano Boscutti. To quote the author, "it's a serialized novel based on the crazed weekend Elvis Presley decided to visit President Richard Nixon in search of a Federal Drug Enforcement Agent badge." And crazy it is. But also funny. Each chapter reminds me of a movie script, containing a lot of dialogue written with a humorous twist. The reason this style of writing is successful is, I believe, because Boscutti has done his homework well. What this means is that a lot of the facts are correct, but some episodes exaggerated to great effect. One part I nearly laughed out loud reading was the one where the pilots of the commercial airliner on which Elvis is on board invites him to fly the plane: "Elvis leans forward in the seat, seeming to concentrate on his new job." Another great line is delivered in Elvis suite in Washington when Jerry, hearing Elvis talking to himself in the bathroom, asks if he's all right. "Course I am all right! What the hell can happen to a man in his own damn bathroom?" answers an annoyed Elvis. A new chapter of this novel is posted everyday, and so far it's been an entertaining read (16 chapters are available). Why don't you give it a try and tell me what you think? If you could travel back in time to watch Elvis record a song, a good date to punch into the time machine would be September 11, 1967. The location? RCA's studio B in Nashville. Imagine looking over the shoulder of engineer Jim Malloy, catching a glimpse of Elvis as he walks towards the piano and sits down. 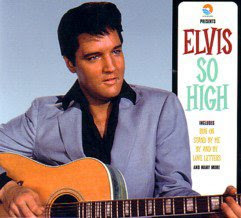 And then, stretching your neck to get a better view, seeing Elvis turn his head in the direction of guitar player Harold Bradley and asking him for an acoustic intro. As Elvis begins to play and softly sing "When you walk through a storm..." you'll cast a quick glance at Bob Moore who's starting to provide a beat on his base supported by Charlie McCoy's chords on the organ. 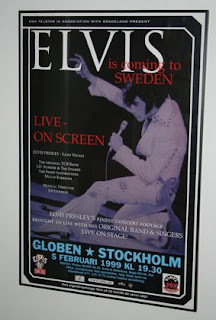 Then you're back watching Elvis bent over the piano, fully committed to the song he has sung so many times at home. You can't help but notice Elvis hammering away at the keys of the piano in that familiar way and smile softly to yourself in recognition. Then, as the Jordanaires ease smoothly into the song and it builds in momentum you get goosebumps on your arms. All too soon, it's over. 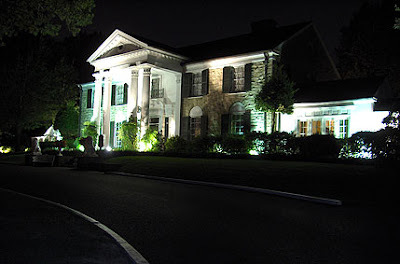 But as the final notes fade away, Elvis starts singing the song from the beginning and the musicians fall in. This time, as Elvis throws himself completely into the performance, it's even more dramatic, and producer Felton Jarvis, who's right there beside you, has a satisfied expression on his face. I bet you have too. PS: If you don't own a time machine, use the next best thing, the excellent FTD release So High. Play track number 20, close your eyes and travel back in time.